"Get younger, flawless and milky white skin!" - Get Your Glow Back! Dark spots, melasma, freckles, dark circles, dark underarms,etc. These are all words to describe areas of the skin that are pigmented due to sun exposure, medications, or genetics. 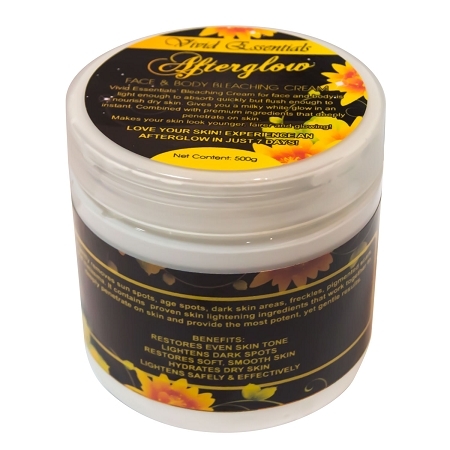 Vivid Essentials Afterglow Whitening Cream for face and body is used to suppress pigmentation in order to lighten hyperpigmented and dark areas. It is light enough to to absorb quickly but flush enough to nourish dry skin. Combined with premium ingredients to effectively whiten skin, Afterglow gives you that instant white finish, at the same time it deeply penetrates on skin. Thus, continuously whitens your skin. Non-Comedogenic & Antibacterial. All natural ingredients that will make your skin GLOW! ! ! This formula does not contain hydroquinone or mercury. Apply daily on face and body. Best to apply after bath or before bedtime. Good product that works as described and whitens the skin over 10 days. however it's too thick and doesnt absorb easily. Leaves white residues. Best way to use is to mix with olive or baby oil. Smells nice,just starting using it but I havent seen any result yet cuz itz only my 2nd day of me using it!ill keep u guyz updated! But so far I love the smell!i give it a 5 star just for the smell.